I was born in Hlabisa, a town in Northern KwaZulu-Natal (Zululand). I grew up and attended school there, after which I moved to Durban to study Public Relations through UNISA. For my Public Relations In-service Training I was placed at Hilltop Camp in Hluhluwe-iMfolozi Game Reserve. 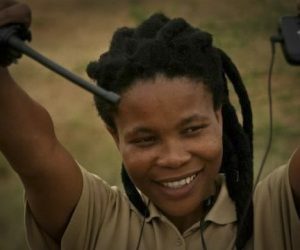 After observing and speaking to the field staff and rangers there, I realised that Public Relations was not what I really wanted to do – my real desire was to work in the outdoors. I then joined Ezemvelo KZN Wildlife as part of an Alien Plant Removal project in Hluhluwe-iMfolozi Game Reserve. After that I completed my Community Guide Training, worked as an assistant on the African Wild Dog monitoring project, and as a Community Environmental Educator. I was working as part of a Game Count team in Hluhluwe-iMfolozi Reserve when I heard about the monitoring position in Mkhuze Game Reserve. That was in 2008, and since then I have been part of the Wildlife ACT team. In 2011 my position changed once more as I became a rotational monitor on all 4 Reserves, which is an exciting new challenge for me. The main reason I enjoy my job is that I get to work with endangered species, which I love, and that I get to meet so many different people from around the world!